Sourcers and recruiters are often tasked with finding candidates that have experience in a specific industry. I’m sure that such a thing seems easy to the hiring managers and clients making the request, but it’s actually not an easily accomplished feat to perform exhaustively. Sure, finding some people who work in a specific industry is easy – simply target one or a few major companies/competitors and you’re off to the races, right? Not so fast, unless you’re happy only finding some people and you’re not really concerned with finding the best. Most industries are comprised of many companies, and some have several hundred to over 1000! How can anyone say for sure that if they targeted 10 or fewer companies in an industry that they were exposing themselves to the best talent available? Some people (and companies) think that the best talent can only come from a short list of companies they’ve identified, which seems both absurd and short-sighted in my opinion. The most talented “game changers” don’t always come from a blue chip Fortune 500 company. However, even if a sourcer/recruiter wanted to identify people who worked at any one of a large number of companies in a particular industry, they are stuck to only searching for a few companies at a time because most search engines/interfaces have limits to the length of the search string that can be run. 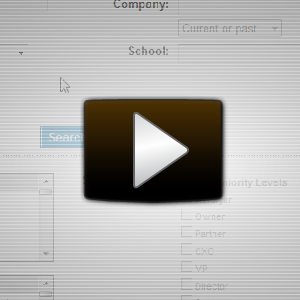 This can make for an extremely tedious and laborious search process, which explains why most sourcers and recruiters only search for a handful of companies or make use of built-in industry search functionality. However, a while back I wrote about the intrinsic challenges and limitations of searching for people based on an industry selection which can actually prevent you from finding the people you’re looking for. A large part of the problem lies in the fact that many people have experience working in more than one industry, yet they can only select one on their LinkedIn profile. The other issue at hand comes from the fact that people can and will identify themselves in any way they want to – which may have nothing to do with the way YOU would identify or label them. Of course this challenge isn’t limited to LinkedIn or social media in general – this phenomenon also occurs in job board resume databases and corporate ATS/CRM systems with similar functionality. Is There a Better Way to Search for Industry-Specific Experience? Let’s say you are in need of finding people with SAP experience who have worked in the Food Production industry. If this were something you were asked to do on a regular basis, you’d probably have a list of companies that you typically target for these folks. However, even if you didn’t you can easily create one. Using LinkedIn’s company search functionality, you can browse for your industry and make appropriate selections amongst the various search options to end up with a list of companies that fit your criteria. 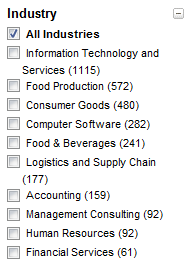 In the example, I refined the search down to 116 companies. Most sourcers and recruiters only search for a handful of companies at a time (or at all), typically due to the limitations of most search interfaces/engines. If you take a look at all of the industries in the search results, you’ll see that most of the people who have worked for one of the 116 Food Production companies we searched for did not choose “Food Production” – only about 18% of the results from the top 10 industries represented in the results come from “Food Production” (572 out of 3,181). If someone was searching for people who mention SAP on their LinkedIn profile and who selected the Food Production industry, they would only be finding a small fraction of the total available and relevant results! 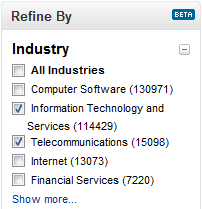 The ability to search for large volumes of companies in a particular industry (I’ve had no issues with 300+!) gives you a more exhaustive and complete method of identifying potential talent with specific industry experience, regardless of which industry the potential candidates selected when creating/updating their profile. Of course, when crafting company searches, you’ll have to keep in mind that there are often many ways that people will write company names – you can only find exactly what you search for in most cases.